Junichi Kanai started making documentaries and video works at University. In 2007, his writing work “Courtship” won the Grand Prize for Screenplay at Isama Studio Cinema Festival. Later, “New Directions in Japanese Cinema Project” chose Kanai to make his first 35 mm short film “PEDAL”. Dubai Film Festival selected this film for Asia African Short Film Competition. 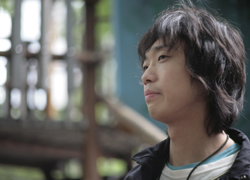 In 2012, his short film “Transferring” won the Best National Short and Best Director at SAPPORO SHORT FEST 2012, and it also won the SONJE AWARD Special Mention at BUSAN International Film Festival 2012. Kanai’s first feature “Again”(2013) was nominated for the BUSAN International Film Festival in New Currents competition, also it won the Audience Award at 20th FICA Vesoul Awards 2014 (France).